It’s been a few months since I last posted anything about diet and Prof. Tim Noakes, but being reminded of the hearing that’s set to resume next month led me to check in on his Twitter echo chamber, which in turn leads to my presenting these few morsels to you. First up, Austin Bradford Hill, who (according to Noakes, at least) taught that association only provides evidence for causation when a study’s Hazard Ratio (HR) is above 2.0. With the assistance of this factoid, Noakes has been dismissing inconvenient results with quips about “Bradford Hill turning in his grave” and so forth. The Hill paper that Noakes cites (the text of a speech in this case) is indeed very good. It cautions us that systematic errors are prevalent enough in our research that we should be wary of placing too much faith in statistical significance as a guarantee of anything, and that health-related interventions need to be thought about carefully, in light of potential costs and benefits (rather than only with reference to what the evidence tells us). None of my nine viewpoints can bring indisputable evidence for or against the cause-and-effect hypothesis and none can be required as a sine qua non. In other words, Hill is explicit that he’s not offering a hard-and-fast rule, but rather some useful rules of thumb. Here’s a lovely application of those rules of thumb to chiropractic, for those who don’t want to read the Hill speech itself. The point, of course, is that Hill is here being misrepresented as a dogmatist, in order to give Noakes another of his stock-phrase putdowns (“cognitive dissonance”, “The Anointed”, “follow the money”, “go ahead, make my day” and so forth). So, if it’s still the consensus view that limiting saturated fat (or rather, replacing it with unsaturated fat or whole grains rather than refined grains) is a good idea to minimise cardiovascular disease risk, it seems to me that Hill would accept the “violation” of his (non) rule for the sake of prudence. But that exact study linked above (the actual paper is open-access, so you can read it if you like) is one of those that we should “pay no attention to”, “as Bradford Hill taught”. Don’t get me wrong – of course it’s true that it’s difficult to establish causation from association. But it’s also true that absence of evidence is not evidence of absence – and that we need to apply our standards consistently, and honestly. Hill didn’t give us a rule (that’s the honesty bit), and even if he had done so, I’m pretty sure that a trawl through Noakes’s timeline would give us many examples of him uncritically linking to pro-Banting literature that violates the rule (that’s the consistency bit). Speaking of consistency, and the Banting-brigade’s fondness for accusing critics of being in the pockets of Big Potato (or compromised by some nefarious interest), I wonder how they feel about Nina Teicholz, lobbyist extraordinaire, being bankrolled by a billionaire? I don’t think it necessarily a problem at all – as I’ve said in previous posts, we need to separate the claims from the funding – but if conflict of interest is a problem (as Banters claim), you don’t get to ignore it just because you like what the person is saying. To repeat a point I’ve now made many times over the years, the issue for me is not the science – that’s evolving, as it tends to do, and there are still many unanswered questions related to diet and its effect on health, weight and so forth. The issue I am concerned with is misrepresentation, cherry-picking, logic and the substitution of soundbites and celebrity for scientific rigour (on that, here’s a good piece by Sarah Wild). Recent studies suggest that low carbohydrate diets appear to be safe and effective over the short term, but show no statistical differences from control diets with higher carbohydrate content and cannot be recommended as the default treatment for people with type 2 diabetes. The authors also note that “passion in science is an infallible marker of lack of evidence” – and while I think that overstates the matter somewhat, it’s again a useful rule of thumb. Someone linked my tweet of that study to Noakes earlier today. His response perfectly captures the problem, and that response is a) to ignore it in favour of cherry-picked alternatives; and b) to suggest malice or bias on the part of those who disagree with him. To answer the “why” in that last tweet: because I’m linking to the review of RCTs mainly to demonstrate that the evidence is contested, and that there’s no room for dogmatism in this debate (or in any scientific debate that isn’t settled). If there was as prominent and influential a scientist as Noakes arguing as dogmatically on another topic that I’m interested in, articles on that topic would attract a similar amount of attention, at least from me. The “why” is of course not sincere at all, but instead simply an opportunity for disciples to dismiss contrary evidence as conspiracy. 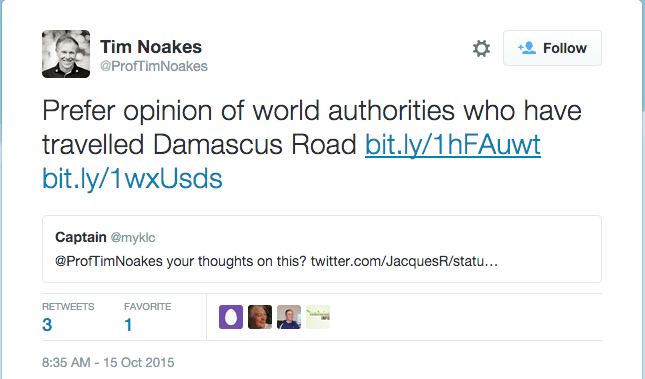 If you’re looking for a textbook example of motivated reasoning, the Noakes timeline is pure gold. This is post 26 of 35 in the series “Noakes”.